Built by Budd as 10 Roomette-6 Double Bedroom Sleeping Car for the Union Pacific Railroad in 1950. Numbered 1444 and named "Pacific Terrace". Conveyed to Amtrak in 1971 and numbered 2637. Converted to Head-End Power from Steam Heat in January 1980 and renumbered 2889. Converted to a Crew Dorm/Lounge car in February 1998 and renumbered 2509. The car retained the "Pacific Terrace" name from 1971 until its final conversion to a buffer car. 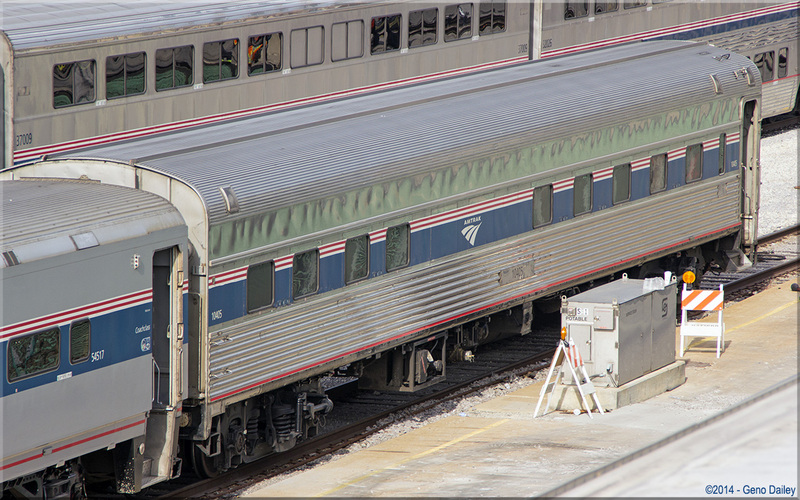 Converted to a buffer car used to ferry cars between Chicago and the Beech Grove shops and renumbered 10405 in December 2008. Historical information about this car provided by www.amtrakbythenumbers.com.